This is a picture of what the front of the folder should look like. 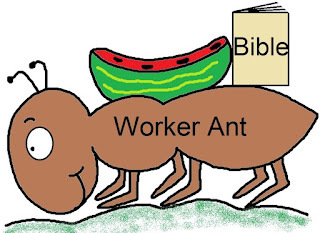 Just print the "Let's Be An Ant" template out and have the child cut the picture out and tape it down to the front. Now if you open the folder up, on the left hand side of the folder is a picture of ants and the scriptures from Proverbs 6:6-8. The bottom say's, "We need to stay busy working for God!" 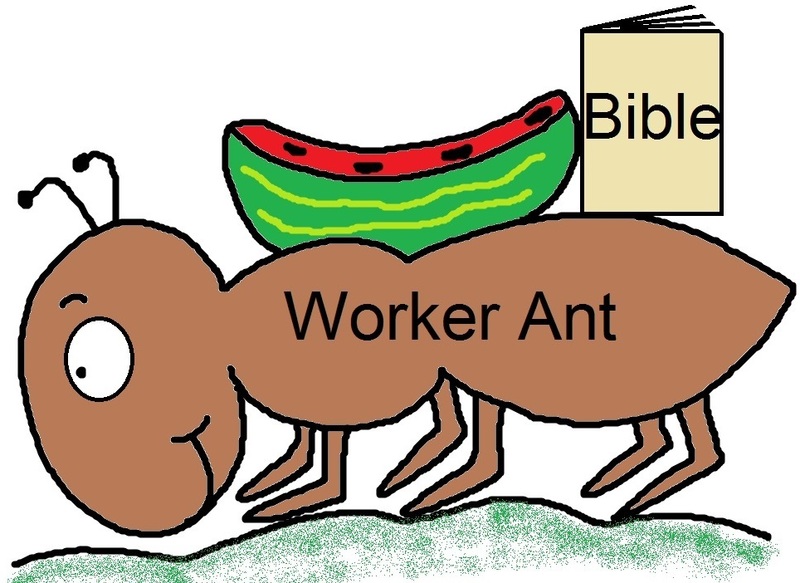 Just print the template out and have the children cut the ants out and tape all three ants to the left side of the folder along with the scripture. The words, "We need to stay busy working for God" is on the other printable sheet. There are two small ants they do not have bodies. These two ants are going to be a little hard for the kids to cut out depending on the ages. These two ants will go on top of the ant hill. The ant hill is made from black and brown construction paper. Just cut the shape of ant hill out of brown and black construction paper. Make sure they are the same size. Then use a pencil or pen and draw a path for the ants onto the brown construction paper. They will need to cut this out and then tape the brown construction paper to the black so that way it will show up. Then the kids will need to add their two ants to the top of that and tape a paper umbrella to the hand of one of the ants. Have the children add some Elmer's glue and put some "eggs and food" (rice, noodles and oatmeal flakes) inside of their little dens. The rice looks like some pretty realistic eggs! The point behind this lesson is that ants are always busy working and gathering food up for the winter. We need to stay busy working for God. However, notice that they do hibernate during the winter. We should not work ourselves around the clock until we are burned out.The Bible specifically say's to consider the ants. Which means take a look at their character. They stay on the go up until the winter time.We should balance our work as well. A a child you might be wondering what it is that you could do for the Lord. Well, let's just see. You could visit the sick, bake some cookies for a neighbor and take it to them with a special note that say's Jesus loves you. You could help in Sunday school class and ask your teacher if you could help do something. You could witness to your friends about Jesus. You could pray for others. There are lot's of things to do and God needs our help to make sure that the message of his gospel gets to others. We are the little feet that need to go into the world and spread the good news of JESUS! We should stay busy doing something for the Lord even if it seems small. The Lord is pleased when we try our best and give our ALL in everything we do. He will bless those that work for him and try. We have to stay busy like a little ant to make sure that we are storing up our treasures in heaven. We must work while it is day and while there is still time. Pray, study the Bible, go to church, visit the sick, help others, volunteer for things. Tell others about Jesus....It's just a simple message that other's need to hear. Jesus can save their soul. That's what's it all about! It might be hard along the way, but that's okay. It won't stay difficult forever. Ants have to crawl and cover areas that might be a little hard to reach at times, but it's worth it because when winter gets there they will be able to enjoy the fruit of their labor. Keep on moving for God. It will be worth it in the end.